Common signs in diesel vehicles include engine misfires, issues starting in the cold, and more smoke coming out of the exhaust. Glow plugs are an engine management component that is found on vehicles equipped with diesel engines. Their purpose is to preheat, and help warm up the engine’s cylinders so that diesel combustion can occur more easily. They play an especially important part in warming the vehicle’s cylinders during cold starts, where starting the engine is most difficult. 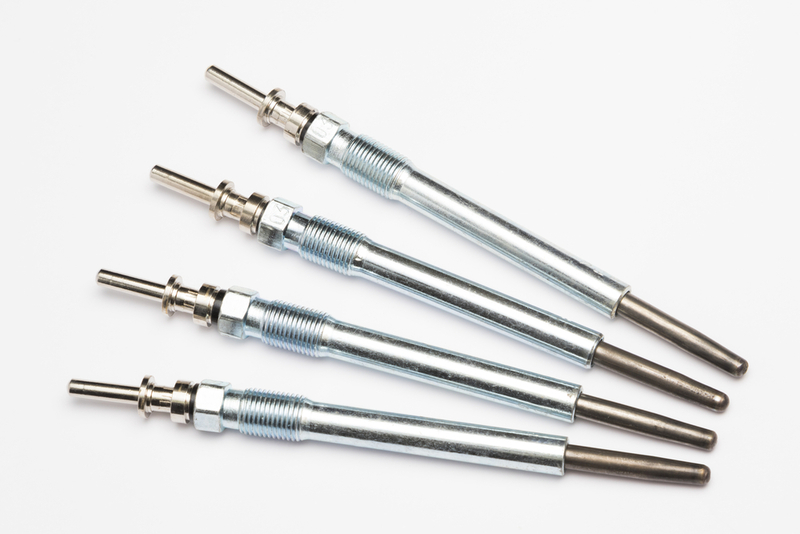 Glow plugs use an electrode which will warm up and glow orange when current is applied. When the glow plugs have an issue, they can usually cause problems with the driveability of the vehicle. Usually bad or failing glow plugs will produce a few symptoms that can alert the driver of a potential issue. Engine misfires are one of the first symptoms of an issue with the vehicle’s glow plugs. If the glow plugs malfunction they will not provide the additional heat that aids in diesel combustion, which may cause the engine to experience misfires. The misfires may cause a loss in power, acceleration, and even fuel efficiency. Another symptom of an issue with the vehicle’s glow plugs is hard starting. Unlike gasoline engines, which use a spark to ignite the fuel mixture, diesel engines rely solely on cylinder pressures to ignite the diesel fuel mixture. If the glow plugs fail, the engine will have to overcome additional pressure in order to ignite the mixture, which may result in hard starting. Another symptom of an issue with the glow plugs is black smoke from the exhaust. Faulty glow plugs may disturb the sensitive diesel combustion process, which may cause the engine to produce black smoke from the tailpipe. Black smoke can also be caused by a wide variety of other issues, so having the engine properly diagnosed is highly recommended. Glow plugs are found on virtually all diesel engines, and play an important role in starting and operating the engine. If your vehicle is displaying any of the symptoms above, or you suspect that your glow plugs may be having an issue, have the vehicle inspected by a professional technician, such as one from yourMechanic, to determine if the glow plugs need to be replaced. Q: How Do Spark Plugs Work in an Engine? Q: cold start issues and would not start in 28 degree weather.